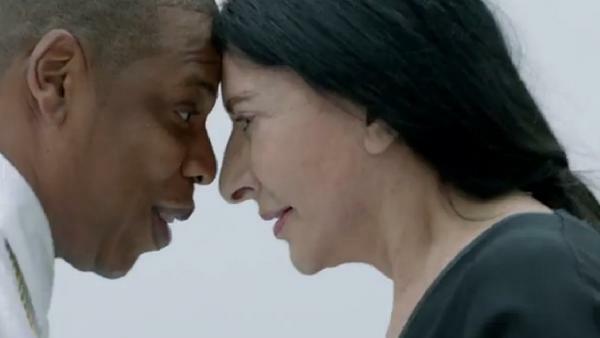 Jay Z and Marina Abromovic eye to eye. The summer of 2013 has largely been about rapper/music mogul/sports agent Jay Z. Even without a real radio hit, he's remained at the center of the conversation with his #newrules approach to marketing his latest studio album, Magna Carta Holy Grail. The opening salvo was a 3-minute Samsung ad announcing the album title and release date that first appeared during Game 5 of the NBA Finals. The phone company bought a million copies of the album (most likely before it was even done), the RIAA changed their rules about bulk corporate buys and Jay Z went platinum before a single consumer had the chance to run out to the record store. Friday night was no different. Jay once again took to grandstanding on his music peers by appearing on Real Time with Bill Maher discussing public housing, America's lack of a middle class and NYC's unpopular use of stop and frisk all before the world premiere of a music video for one of his new songs, "Picasso Baby." In the interviews Jay has given this summer, with major market commercial radio stations, the BBC and new media personalities, he's pushed the idea that his moves as of late are bigger than album promotion — he sees himself as injecting new life and alternative revenue streams into a dying music industry model. The video for "Picasso Baby" — sorry, "Picasso Baby: A Performance Art Film" — was shot at Pace Gallery in New York City's Chelsea in July, with a backdrop of adoring fans, famous actors, fashion designers and artists. They ring the room while some of those in attendance step up and interact with Jay as he performs the song. It's a version of Marina Abramovic's performance art piece "The Artist Is Present," which she put on three years ago at the Museum of Modern Art. Except she was silent. Jay is not, and the energy, at least as captured by the video, is at 11. At the beginning Jay says "concerts are pretty much performance art." At the end, he says "rap is thinking out loud." His face is open and the connections he makes with the people in the video — actors like Taraji P. Henson, Michael K. Williams and Rosie Perez who vibe with him, sure, but also Judd Apatow, who pretends to take a phone call, and art dealer Sandra Gering, whose flirty shoulder dip throws Jay for a loop — feel real. Dancers, little boys, mature ladies — they do them, and he does him. Those moments of exchange heat the video, change it from a document to a work of art, but the visual artists who stand in front of and with Jay (his co-stars) represent another conversation — one going on since the 1970s between hip-hop and the art world. If Fab Five Freddy wasn't in this video it would be illegitimate. And now Kehinde Wiley and Mickalene Thomas and Wangechi Mutu have to be in the room. And then, of course George Condo, name-checked in the song itself, Lawrence Weiner, who also manipulates words, and Andres Serrano, who knows what it is to be vilified. Jay catches some flack for mentioning only the most crossover artists and art institutions in his lyrics — and some of his ideas about property conflict with the concerns of art stewardship ("go ahead and lean on that s---, Blue, you own it") — but in the "Picasso Baby" video he relates to figures of the contemporary art world naturally. Some of them may have been asked to appear here, but when he calls artists and hip-hop musicians "cousins," it fits. That's the convergance that director Mark Romanek pulls focus on. He exploits mirrored sunglasses and smears Storyboard P's dance over the bridge and it all adds up to warmth. These people like each other. Artists and musicians are usually told they're different. They don't fit in. They're crazy. They're too much. But people who don't see the world the way they're told the world is recognize that quality in other people. We're kidding ourselves if we say any of this is new, or much more complicated than awesome — this is Jay noticing another method of pushing our topics of conversation around and an opportunity to use the bodily reaction most people have to his presence to be creative. But it's also more proof that what he makes matters to people. Catch that little smile on security's face when Jay walks in the room.